The Madison Hotel is a corner building with another entrance (click for image) at 62 Madison Ave.
25 Oct. 1901 the New York Times, p. 14, reported: "Joseph Wolf, the owner of the northwest corner of Madison Avenue and Twenty-seventh Street, a lot 24.9 by 90, will erect thereon an eleven-story hotel, costing $145,000. The plans were filed at the Building Department yesterday by Charles Brendon & Co., the architects." In Dec. 1903 the Times further reported: "Charles Buek has sold the Hotel Brayton at the northwest corner of Madison Avenue and Twenty-seventh Street, an eleven-story structure on lot 24.9 by 95, to Mrs. E. J. Smith, for about $250,000... The Brayton is leased for fifteen years at an annual net rental of about $18,000." In March 1904 the Times published a map of the buildings on the block bound by 27th St., Madison Ave., 28th St., and 5th Ave. The Madison Hotel appears in the lower right corner (click for image). The names on this map are the names of the property owners. The lot at 62 Madison Ave. is owned by Eliz. J. Smith. 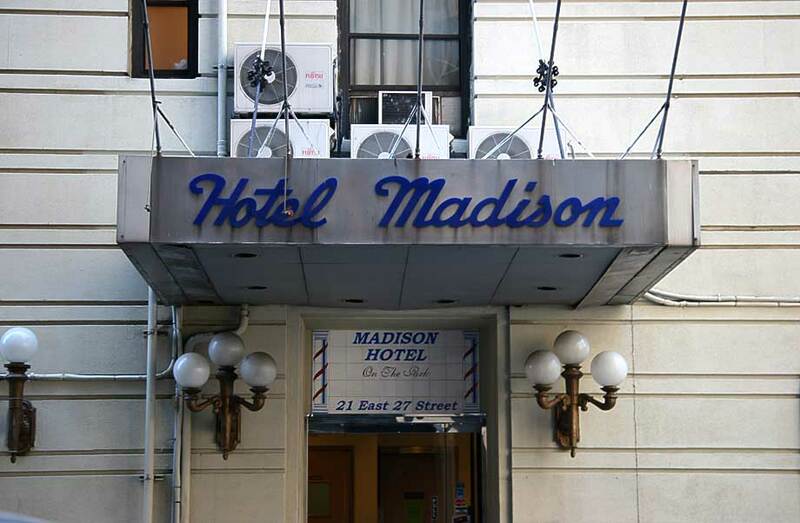 Initially called the Hotel Brayton, the name changed to Madison Hotel in 1911. This ad for the Brayton appeared in the New York Times, 30 Aug 1903. A later ad for the Brayton appeared in 1905. The New York Public Library's Digital Collections contains a photo of the Hotel Madison in 1911 (click for image). The verso of this photo is labeled "The building on the northwest corner of 27th Street is the Hotel Madison. 1911." Both of these photos seem to show that the hotel did not have an entrance on 21st St. in its early years. Another photo in the New York Public Library digital gallery shows of view of Madison Square dated about 1902. The Hotel Brayton can be seen in the distance while still under construction (click for image). Cattycorner across Madison Ave. in this view is Madison Square Garden.